My cards have been rolling off the hamster wheel right and left and I'm nearly done. Yesterday, the town Post Office crowned me Sweetheart of the 2015 Season of Sending Smiles and thanked me for doing my part to keep them afloat and aflutter. It was all pomp and ceremony and I maintained my Dee Corum personality until they served the dessert wine and the speakers at the podium started having a difficult time articulating my new title. This fun stocking stamp is from All Night Media. I colored the image with my SAI markers and then glazed it for plumping and shine. A simple band of woodgrain Washi tape provides a lovely mantel and the fitting sediment is from the PTI "Tree Trimming Trio" set. I made this card to play in the one-layer card challenge at Less Is More where the theme is, "What's In My Stocking?" I think if you look closely at the stocking on the far left, you'll detect some movement and I think you can guess what's in my stocking. And, yeah, no, I don't know which one it is! Enjoy these designs. I'm really pleased with how much patterned paper I used from my stash this year. As before, if you'd like any details, please let me know. I'm embarrassed to say that if you have asked me a question in an earlier post and I haven't answered, please forgive me and ask again as I've gotten terribly behind in answering my mail and visiting others. I promise I'll catch up after the holidays. Challenge: The Male Room: Christmas or Seasonal Greetings. Washi tape laid in rows and then cut with Memory Box die. Challenge: Pixie's Snippets Playground: Use your snippets! You've seen a different version of the above card not too long ago. I love this one with the schparkly foam JOY, punctuated with one schparkly gem. 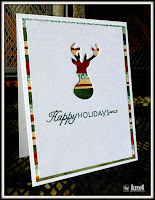 Challenge Simon Says Stamp Monday Challenge: Just a Pinch. Left: natural. Right: Wearing snowsuit for camouflage during hunting season. 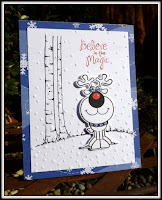 Challenge: STAMPlorations December Theme and Sketch challenge where I'm guesting. I hope you can link up! Wow you have been a busy bee Darnell, I posted my cards last week...and thankfully has made their way into Europe already..hopefully everyone gets before Christmas. The first one is the most adorable one as I am a one layer girl..and I love the sentiment...the washing tape one is very inspiring. .I will surely try out. Merry Christmas to you. Oh I do love that mantle and the (shrunken) socks Darnall - especially all the sheen and sparkle in the close up photo! You really have had Hammy and the family working hard to have all those cards to share. Hope you give them a few days off over the Christmas break. A seriously cram packed post of gorgeous cards today Darnell, you have been so busy. 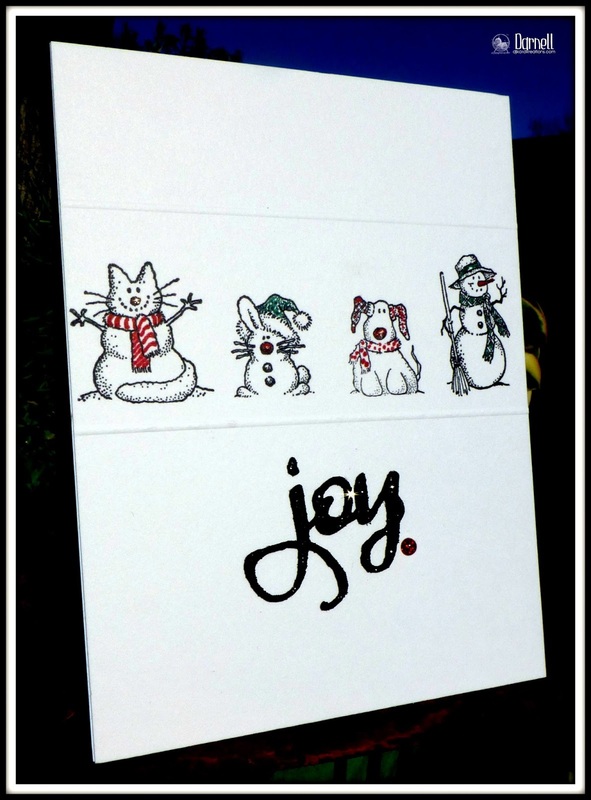 Love them all and wish I had your inspiration and verve at the moment to get finished with my cards. Only a few to go but they seem to be taking me ages. 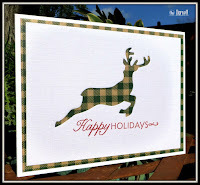 Love those tartan deer!! So glad you shared them with us at TMR. Happy Christmas to you. You sure have been busy. I love them all, but I am a sucker for the cute animal ones. I loveeeeeeeeee those stockings!! So colorful and fun!!!!!!!!!!!!!!!!!!!!!!!!!!!! 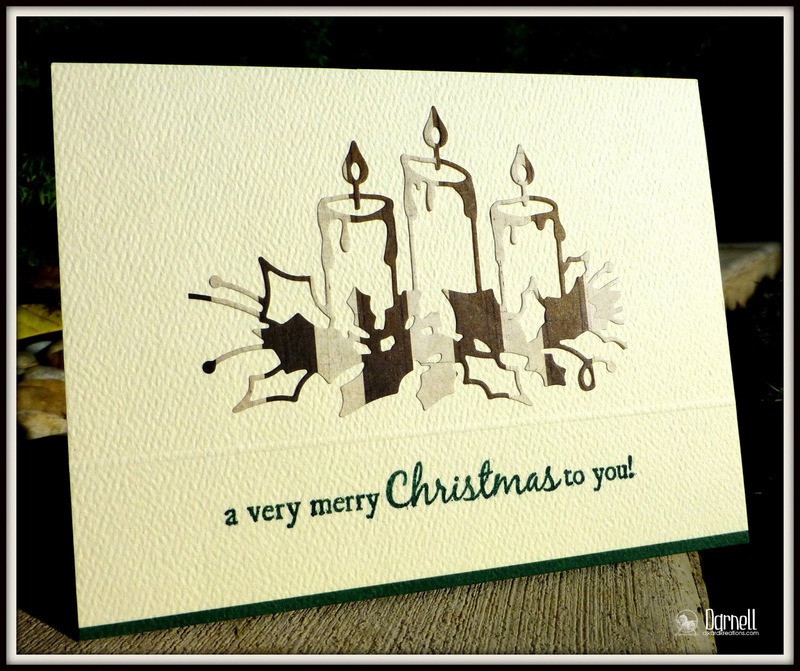 I am in awe of how many gorgeous christmas cards you and the hamsters have made. You are well deserving of your title :) The mantle and socks are just a stand out from today's collection. So beautiful cards all of them! 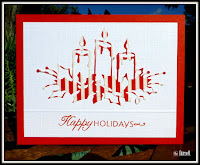 I love the fact that you use everything from your die cuts! so inspiring! You are one busy hamster, Darnell. And it looks like you might have lost one in your first card! :) Congrats on the new award, too. It's just nice to be noticed, isn't it? 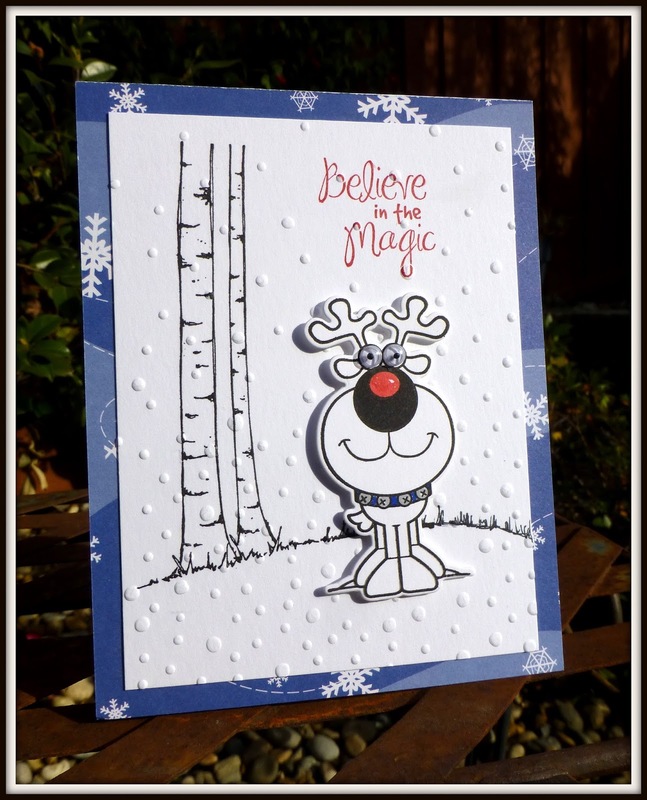 :) Your cards are great and I'm so impressed at how many you are able to create! Congrats on that as well. You are the queen of qacas!! 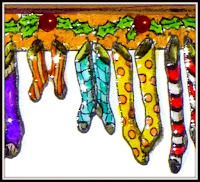 The card is fun with those colorful stockings as is your description! And I often think that we stampers keep the post office running. They haven't thanked me yet but I am glad to read that you have been honored! What a treat so much inspiration! Love the first and the dogs in a row-cards most. I have to use more patterned paper on my cards or they a;; end up under a pile of gesso on mixed media project I think... Have a fun week! Oh my!!! You have been soooooo busy in this time!!! How many beautiful cards you made! All them are gorgous an love your use of negative! Fabulous works! I'd say you must be the star of the Post Office...think you're insuring their continued employment all by yourself. You should have received a gold watch or something equivalent. So envious that you were able to use not only so much patterned paper but washi tape, as well. Each and everyone of these cards is a minor masterpiece, but the coloring on that stocking card is AWESOME! Oh my goodness - you HAVE been busy, haven't you!! Your cards are all so awesome. What an array of lovely cards. You have been a busy lady. Glad you were able to use some scraps from your stash. I need to do that too. Have a great week and Merry Christmas & Happy New Year to you. Holy smokes Darnell, you have been one busy card maker!! These are all simply delightful and will bring smiles wherever they go!! You make me feel like a slacker, Darnell. It's a beautiful array of cards that you have made and yes, I detected the movement in the stocking. What a great touch. I am partial to those googly-eyed reindeer though. 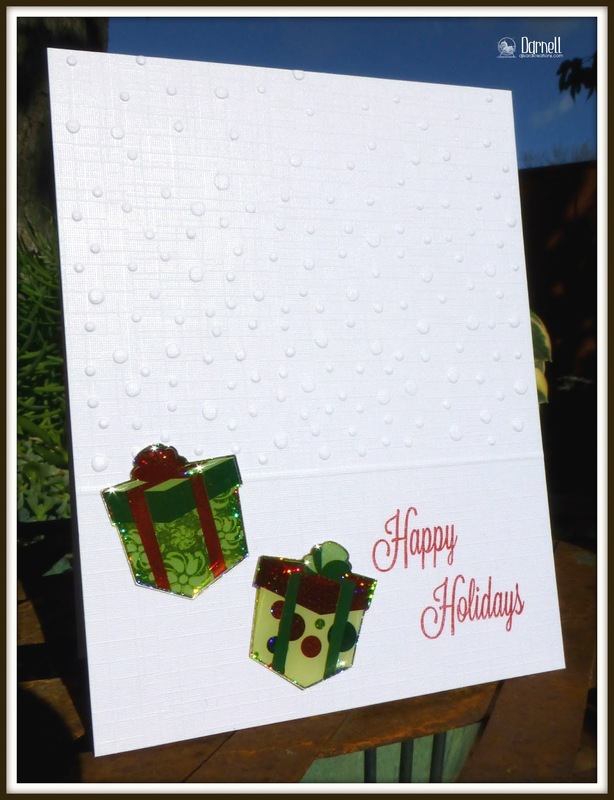 Oh, and I love that you embossed all the backgrounds. Beautiful cards! 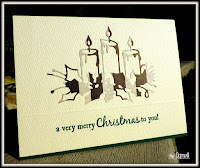 I, too, have been on a Christmas cardmaking binge. However, they don't seem to be multiplying as fast as I'm making them. I'm ready to scream, HELP, CARDMAKING FAIRY! Your cards are gorgeous. 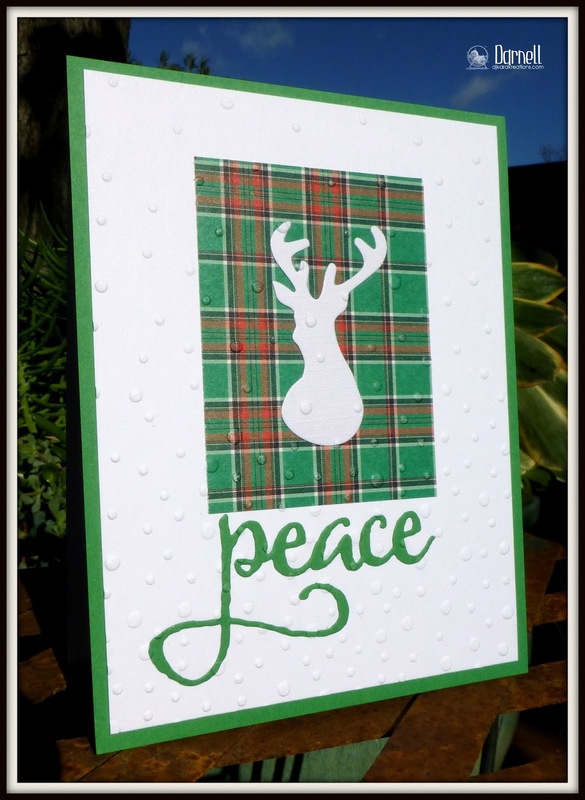 Love your use of patterned paper. What a fabulous array of gorgeous cards Darnell, you have been a very busy bee. I love the row of colourful socks hanging expectantly on the mantel. They're ALL fabulous!!! Love the mantle and stocking card and since the stockings are small, they're probably for me. I DO deserve a bigger one though. 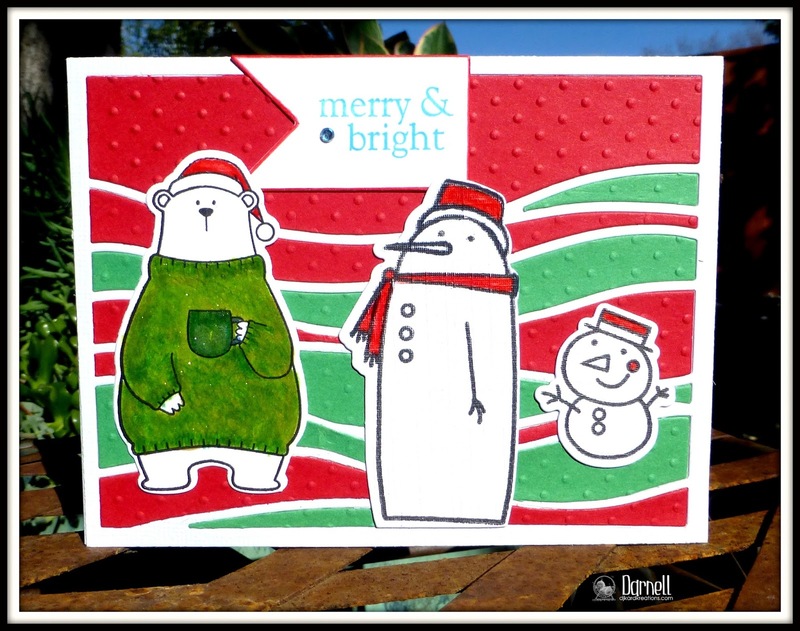 LOVE your cards Darnell! 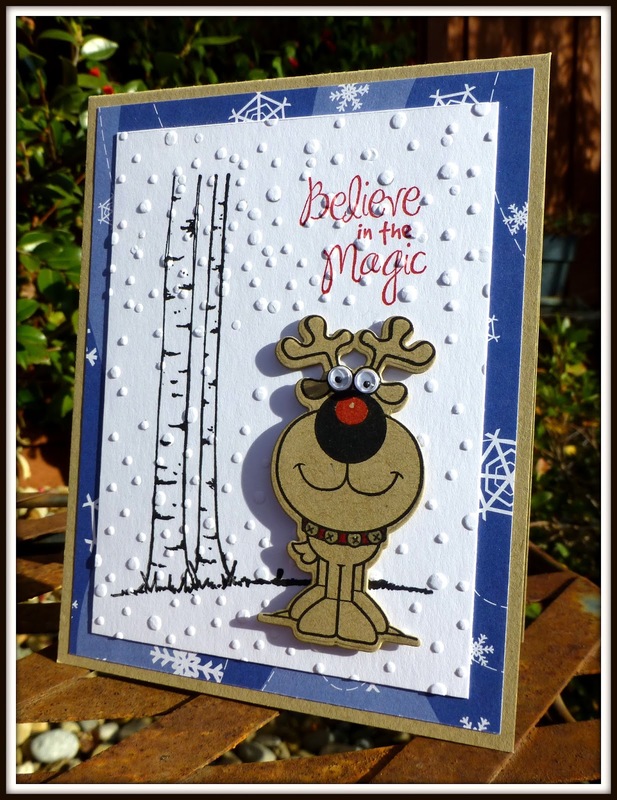 A totally stunning collection here Darnell, some fantastic images and I just log that reindeer. Thanks so much for your wonderful card and it was news to me that you were coming over in the Summer, well you will be lucky if we have one, so could you please pack some sunshine too. Pretty please. Would love to meet you, I am about an hour from Manchester. WOW you've been a busy girl! Beautiful cards, each and every one of them! I love the stocking one! 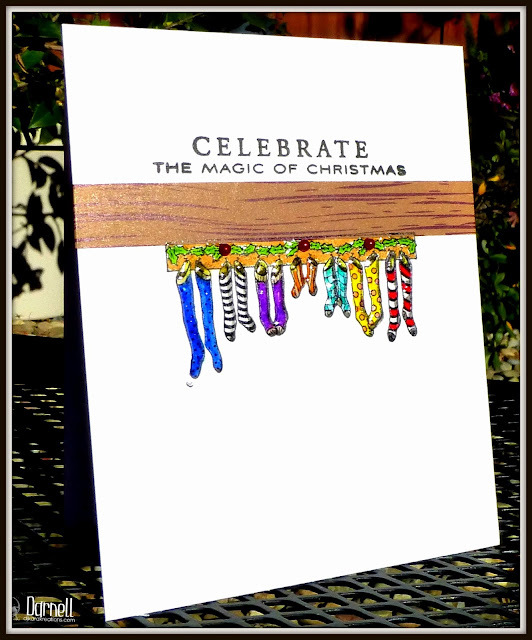 Wheeeee.....you're on a serious card-making roll my friend! I love them all, especially those leaping plaid deer and the shrunken stockings hanging on the mantel :) Great job on all of them! Haha, congrats on your award!! ;) And what a cute little stockings - the glitter is so pretty on them! I love the idea of concentrating on using up your old Christmas stash! I was just going through my stash of whole and Christmas paper scraps, and declaring that something had to be done with all this paper. Unlike others in the comments, I would love to know more about the washi-tape die cuts. Couldn't figure it out by just looking. 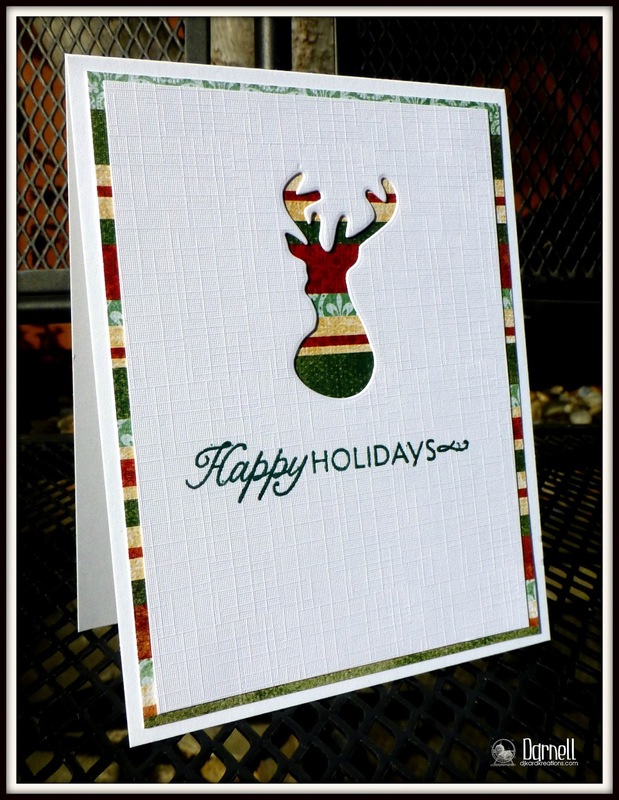 Also, that plaid deer,...is the patterned paper the actual die cut, or is the plaid paper pieced behind the negative of the die-cut? Questions, questions! Maybe I am delaying the finishing of my last four or five cards? All so fabulously wonderful Darnell, I get all excited when I use my patterned paper, because usually I have it just to look at. Those bright stockings also made me smile, what a fun collection of colours and patterns! That hamster wheel must have been shooting flames with this creativity being churned out by 'the gang'....except for the wee rodent that may have been napping in the stocking! 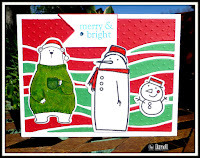 Ah-mazing cards Darnell! Every single one of them is perfectly crafted and brilliant! 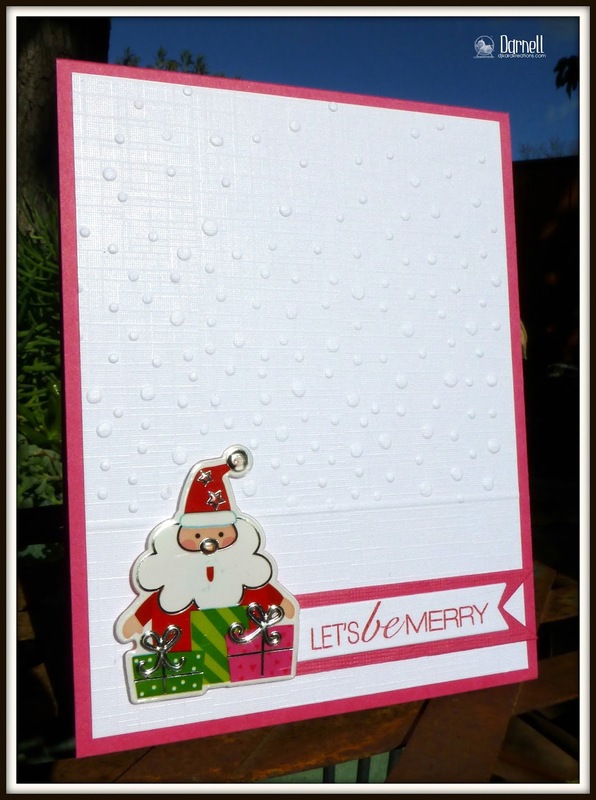 Yep...I'm picking a favorite again...it's the sweet little Santa informing us that we must all 'be merry'....and merry we are after seeing this these fine examples of seasonal happy mail! I'm equally behind in posting/commenting! Marvelous job! So much inspiration all in one day, what's a gal to do but hurry to catch up? A super dooper snippets card of course as well - thanks for coming to play. Sorry I'm late commenting - playing catch up here! You work well under pressure, my friend! GFY using some of that DP. I still have way too much of it. Why do I keep buying more? Another terrific collection of cards Darnell! I love the stockings and think they are perfectly sized to the mantel. Their size and how wonderfully colorful they are make me think of stockings in Whoville. Totally delightful Darnell, love all the different length of stocking although not sure I'd be happy with the diddy ones!!! Hee Hee! thanks so much for playing along this week! Every card in this post is a winner! I love them all. So glad to hear you're nearly done with the Christmas card production. You've been working awfully hard!! You must never sleep ! Wow...so many wonderful cards and I love them all! Amazing array of cards Darnell and those stockings are fan dabby dozey! 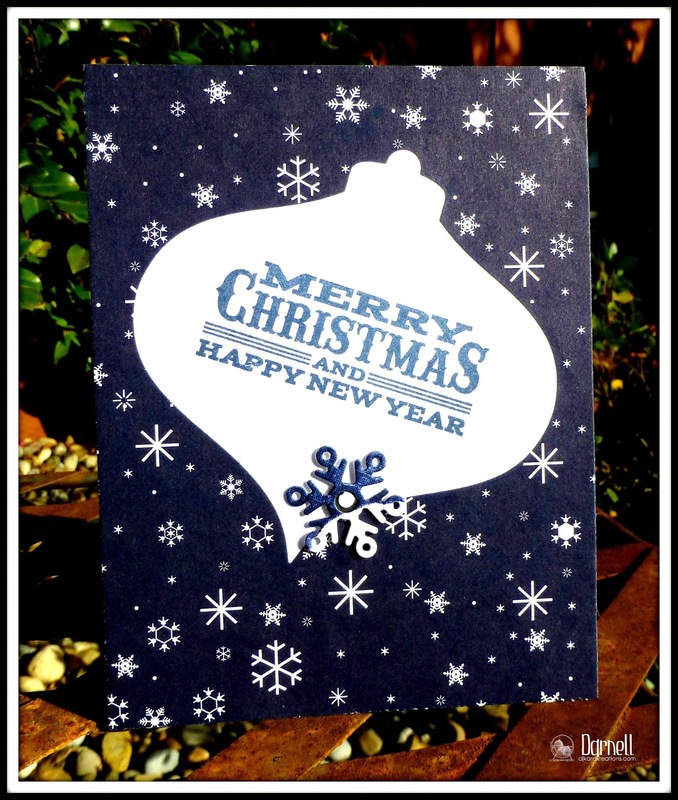 Thank you for your fab Christmas card - safely installed on the wall of Christmas! What an awesome collection of cards, you are so inspiring! In regard to ours...well, the one closest to me closed their doors. Sadly, that makes it more difficult for me to get my cards in the mail. I was spoiled and didn't realize it. Wow Darnell you've been on a production line! Love the taran cards and your little pooches. Wow--you're amazing, my friend! How do you come up with so many great ideas?! I love that woodgrain Washi & the stockings card--super! Gotta try lining up Washi & using a die--never thought of that! The last 2 cards are adorable! By the way--I helped a bit to keep the PO going, so maybe I'm the princess--haha! Wow lots of great cards! I have to say the stockings is my favorite of your holiday cards this season. Fun whimsical and it made me smile. Oh what a wonderful array of cards!! I'm so proud to have received one of your beauties! I too have kept Royal Mail afloat here ... Not that I've been thanked Lol! 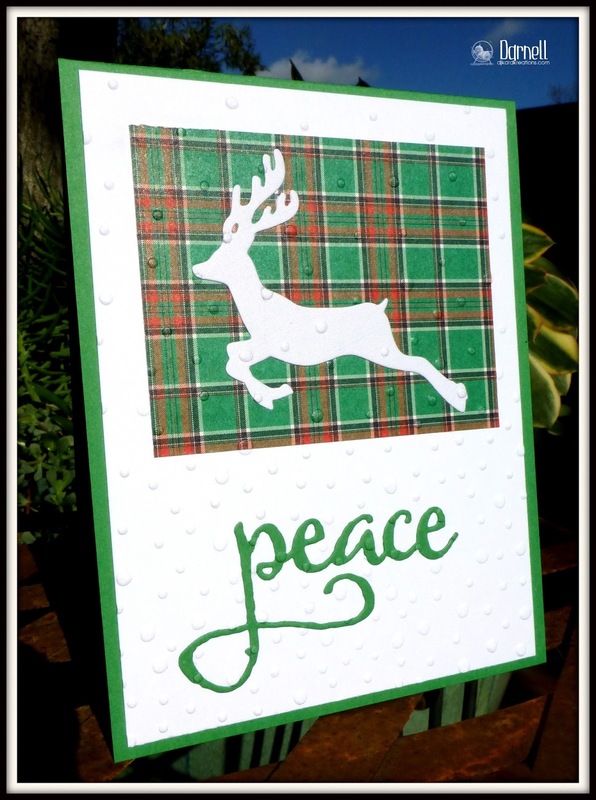 So much gorgeous craftiness in this post, Darnell! 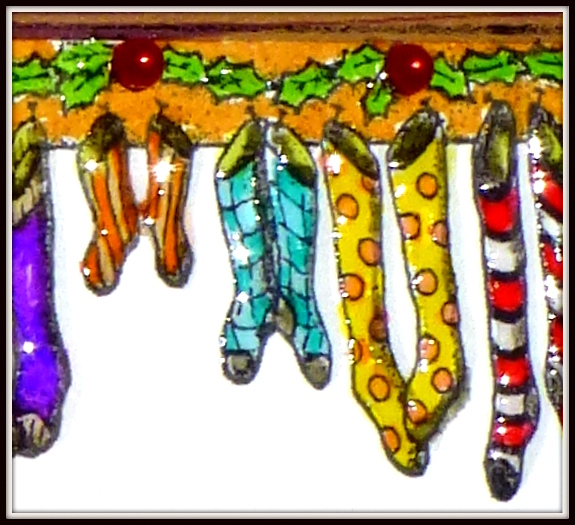 Loving your little gathering of Christmas stockings, so bright and perfectly cheerful for Christmas! So sorry for the late visit! have prepared so many beautiful cards! Beautifully carved elements used, both positive and negative. Great job. WOW, how awesome! 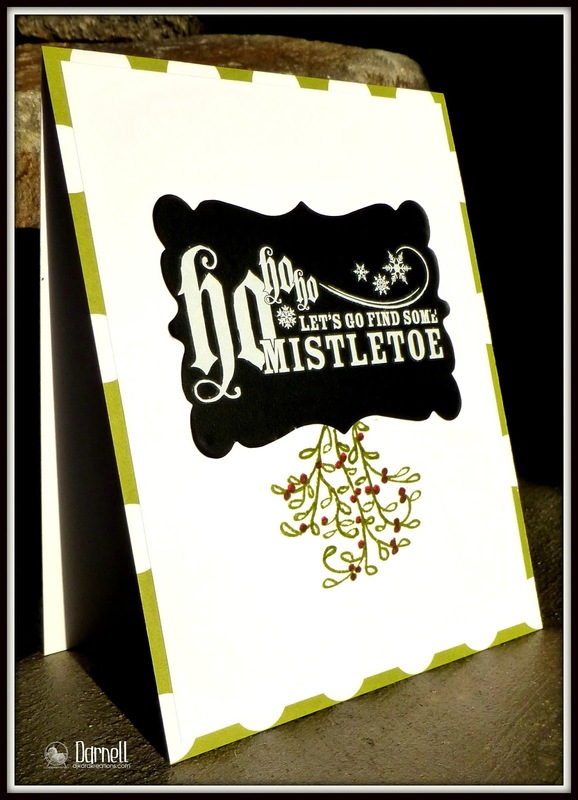 Fabulous array of cards ~ You are the definitely deserving of the Sweetheart crown, Darnell! Love the mantle and all those cahute stockings hanging there too. Wonderful selection of cards. I do enjoy your posts! Thanks so much for playing along with our Christmas challenge at The Male Room. Hope to see you again next year. GREAT to have you guesting with us at STAMPlorations Darnell. 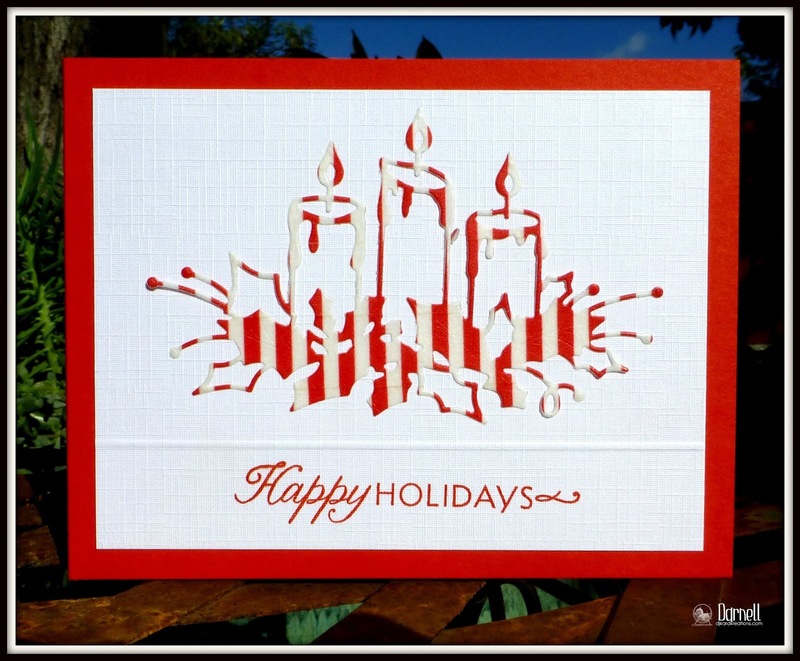 You are a Christmas card making machine!! Those PLUMP stockings aren't full of coal are they?